When you consider the millions of words published as “news” about global warming, a massive hoax based on the theory that an increase in the Earth’s levels of carbon dioxide (CO2), a minor atmospheric gas (0.0380%), it boggles the mind that reporters for a respected newswire, Reuters, would still be writing utter rubbish about it. The U.N. does not have a “weather agency.” It has a propaganda agency devoted in its own words to “climate.” The two are not the same. Weather is what is occurring right now and climate is the measurement of trends over centuries. The authors of the paper based their ice age predictions on “variations in the earth’s orbit and rock samples” and was “conducted by academics at Cambridge University, University College London, the University of Florida, and Norway’s University of Bergen. These people have to justify their salaries and, just like all the other academics who jumped on board the global warming wagon, they are likely among the last holdouts making claims about CO2. Their conclusions are absurd. This isn’t science. It’s the dying gasp of those trying desperately to keep the global warming hoax alive. The science—the known facts—aren’t that difficult to understand. Climatologists have established that, over the 4.5 billion years of the Earth’s existence, ice ages have had interglacial periods that averaged about 11,500 years. Then the Earth lapses into a period of extreme cold. The Earth is 11,500 years since the end of the last major ice age. We are due the onset of the next ice age any day now and when it begins, it will come on so fast that all the manmade CO2 will have no effect whatever. Moreover, CO2 shows up in the atmosphere in a greater quantity AFTER a major climatic event, not before. There have been periods when there was much more CO2 in the atmosphere; the age of the dinosaurs comes to mind. Indeed, when the last big ice age struck, mammoths were literally frozen in place, waiting to be discovered and dug up centuries later, so intact scientists were able to determine what their last meal was! I count myself fortunate to have Robert W. Felix, perhaps the world’s leading authority on ice ages, as my friend. I recommend you visit www.iceagenow.info and benefit from the facts. You can also read “Not by Fire, but by Ice”, his book on the topic of ice ages. In a post on his website regarding the latest nonsense about a distant ice age, Felix cites the fact that Argentina’s Perito Moreno is growing and it is in the southern hemisphere. In addition, glaciers are growing in India, in the Rockies, in California and Washington State. Do you believe that CO2 will stop this growth or have the slightest affect on it? The assertion that “an increase in ice-sheet volume would not be possible” is a lie. Just like all the other lies published about global warming by the IPCC and all the others that sought to profit from the hoax. Do not believe these claims. The Earth has been in a perfectly natural cooling trend since 1998. We are at the end of the most recent interglacial period and could tip into a new ice age tomorrow. 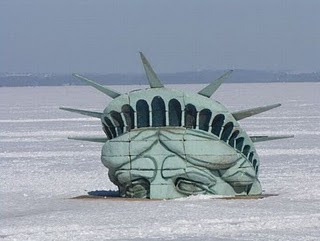 The Ice Age will be CAUSED by Global Warming!!! Seriously, just last Friday night recently a grad student from the University of Washington here in Seattle actually told me that crap at a bar downtown - and became very angry when I told him he was an IDIOT and laughed in his stupid face. Oh! I was the one the management told to leave...After all, this is the People's Republic of Seattle where they LOVE the OWS and Obama. To say that "global warming" is freezing the world is the same as boiling water to get ice cubes. Republicans! Stop Looking for a Messiah!